ICT LAWS In order to preserve the confidentiality and to protect our society from the misuse of improving technology and preach of basic privacy, laws and legislations were passed: Data Protection Act 1998: This Act covers information or data store in the computer or an organised paper filing system e.g. filing cabinet or about living people. The eight principals to Data Protection Act are as following: 1. Must be collected and used fairly and inside the law. 2. Must only be held and used for the reasons given to the Information Commissioner. 3. Can only be used for those registered purposes and only be disclosed to those people mentioned in the register entry. You cannot give it away or sell it unless you said you would to begin with. 4. Information held must be adequate (enough), relevant and not excessive (too much) when compared with the purpose stated in the register. So you must have enough detail but not too much for the job that you are doing with the data. 5. Must be accurate and be kept up to date. There is a duty to keep it up to date, for example to change an address when people move. ...read more. Accessing computer material without permission e.g. looking at someone else's files. 2. Accessing computer material without permission with intent to commit further criminal offences e.g. hacking into the bank's computer and wanting to increase the amount in your account. 3. 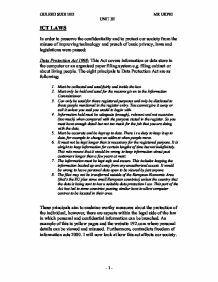 Altering computer data without permission e.g. writing a virus to destroy someone else's data, or actually changing the money in an account. This law was passed with a good purpose but is vague in affectivity. Just making something illegal or setting up regulations does not stop it happening, so responsible computer users need to take reasonable steps to keep their data safe. This includes regular backup and sufficient security with passwords. I will now look at how this act affects our society: HOW COMPUTER MISUSE ACT 1990 AFFECTS MR. IRWIN: ? Trying to gain access into another teacher's files by guessing the teacher's passwords. ? Hacking into other computers, whether it belongs to the school where he works or not. ? Altering computer data without permission for example sending or distributing viruses electronically to damage someone else's data/information HOW COMPUTER MISUSE ACT 1990 AFFECTS MR PATEL: ? He cannot use the internet to access or distribute any indecent material otherwise he could be in trouble with the police and may be sacked or convicted if found guilty ? ...read more. I will now look at how the Copy Right Law affects our society: HOW COPY RIGHT LAW AFFECTS MR. IRWIN: ? It means that Mr. Irwin is not allowed to download illegal music whether it is for him or for his students. ? It means that he cannot photocopy the whole of the text books without permission or that are copyright protected otherwise he would be breaking this law. ? It makes it illegal for him to copy video/ CD's for students. HOW COPY RIGHT LAW AFFECT MR. PATEL: ? He can not copy DVD's and CD's if he is not in a position to do so. ? He cannot copy or download software or music from the internet without permission ? He must have a license for software that he uses to assist in his health HOW COPY RIGHT LAW AFFECT ME AS A STUDENT: ? It stops me from downloading illegal music from the internet ? It stops me from copying and pirating videos and DVDs ? It does not allow me to buy illegal audio and video tapes HOW COPY RIGHT LAW AFFECT THE COMMUNITY: ? It stops idea store from copying copy righted work without permission ? Police cannot download/ copy illegal music ? The Bank cannot use the software's that are not licensed to them GULEED SUDI 10D MR UKPEI UNIT 3E - 1 - ...read more. The data must be relevant and kept for only as long as needed, for instance the library does not need to know my weight, but my school needs to know my medical record, and any information must only be kept until it is no longer needed to be kept. Data controllers will also be required to comply with information notices issued by the Commissioner requesting the data controller to provide certain details in order that the Commissioner can assess whether the provisions of the 1998 Act are being complied with. public, and the very controversial meaning of 'artistic quality' when considering artistic craftsmanship, not every piece of contemporary art will gain copyright. Back to Originality that is a necessity for all work to gain copyright, and not just for artistic work, the meaning of the word has been interpreted very loosely. This is extremely important because without this specific law, the information which Mr. Obrien communicates through to the organisation he is working at can be retrieved and used by anyone for a lot of diverse purposes which can cause many problems for him.